T-Mobile Sim Starter Kit Unactivated "3-in-1" Size. SIM kit has a punch out, compatible with "Regular", "Micro", and "Nano". Compatible with all GSM unlocked phones (including most T-mobile phones), including: iPhone 4s, 5, 5s, 5c, 6, 6s, 6s plus, 7, SE, Samsung Galaxy 3/4/5/6/7. Contact seller before purchasing if you are unsure if this SIM Activation kit is compatible with your phone. Includes $30 activation value. Compatible with any T-mobile or GSM Unlocked phone. 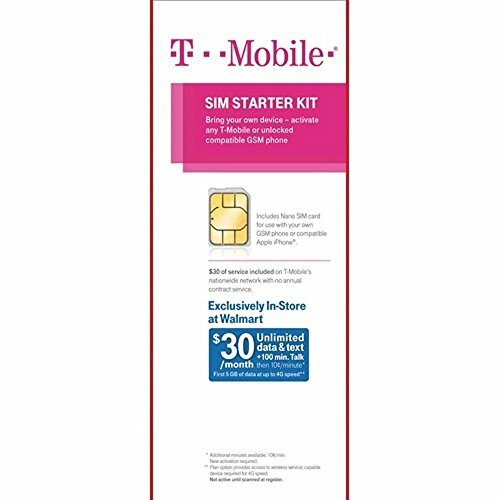 T-Mobile Sim Starter Kit Unactivated "3-in-1" Size. SIM kit has a punch out, compatible with "Regular", "Micro", and "Nano".